There's only one two words that can really describe Tim Burton's film adaptation of Sweeney Todd (a musical by Stephen Sondheim): relentlessly intense. Bloody good would be appropriate as well, but only if you are in a punning mood. I've been a fan of Sondheim since I first discovered Into the Woods my sophomore year of high school. I was introduced to Sweeney Todd four years later at a university performance, and while it was staged well with unexpected twists, the musical failed to really work its way into my subconscious. It wasn't until two years later when I saw Burton's adaptation that I really got hooked. Sondheim is not know for his toe-tapping sing-a-longs, rather he is revered for his brilliant, tongue-twisting lyrics that mix comedy with tragedy and (often quirky) life lessons. I suppose you could say that Sondheim is the Tim Burton of the theatre world. His compositions work for you, or they don't, but it's hard to deny that they have their own unique sort of charm. From the opening frame of Sweeney Todd: The Demon Barber of Fleet Street, it is clear that we are in classic Burton-land once again. The production design is gothic, the colors muted, the style dark and outlandish, yet still strangely beautiful. 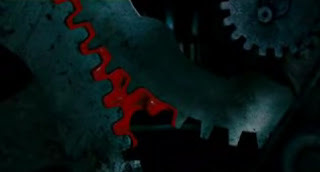 As the opening credits roll and an animated rich, slurpy blood runs down from the barber shop, through a series of mechanics to the basement where Sweeney's victims are turned into pies, it is reminiscent of the chocolate factory opening credits of Burton's Charlie and the Chocolate Factory ... only less delicious. The film follows barber Sweeney Todd (formerly Benjamin Barker) who has returned to London with a vengeance, fifteen years after being wrongly transported by a corrupt judge. In his sixth collaboration with Burton, Johnny Depp once again plays a pale, crazy-haired man with an attachment to sharp, pointy objects, although unlike Edward Scissorhands, Sweeney Todd's attachment to his razor blades is emotional, rather than physical. They are, as he states in one song, his only friends. Depp can sing, yes he can, and he growls his passionate lyrics with a deep, unsettling hatred. While Sweeney is a monstrously unsympathetic man, very different from the innocent Edward or the swashbuckling, morally grey Jack Sparrow, by the startling climax, you may find yourself sympathizing for the barber, despite the fact that he has brutally murdered countless people, and most of them for no good reason at all. Depp is just that kind of brilliant. 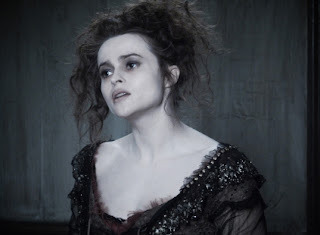 In a performance equally as riveting is Helena Bonham Carter, crazy haired, and oozing with sensuality. On the stage, Mrs. Lovett, the pie shop owner who ingeniously schemes a way of getting rid of the bodies of Sweeney's victims, has traditionally been played by an older, enthusiastic woman, who serves as the comic relief of the musical (Angela Lansbury in the original cast, if that tells you anything). While the film adaptation is not completely devoid of comedy, it is considerably darker than the stage version, and most of that has to do with Burton's decision to make Sweeney Todd as gritty and gory as possible. When blood splurts in gushing waves from slashed throats on the big screen (15 feet high? ), we are not afforded the buffer of distance from the stage and the limitations of special effects to make the throat slashings less traumatic. Burton exploits this, making each murder as bloody and gruesome and immediate as possible. The cherry red blood may be unrealistic, but the violence is undeniably disturbing. Carter was the right choice for a darker Mrs. Lovett, whose affection for Sweeney Todd borders on obsession. Despite the horrors that she commits in her own kitchen, Mrs. Lovett is sympathetic, yearning for affection, and beautiful in a Burton-esq way (with a lovely singing voice to match). There's excellent chemistry between Depp and Carter, and it's not hard to imagine that, were Sweeney Todd a different kind of film, the two might really have ended up happily ever after, by the seaside (oh oh), by the beautiful sea. Warning: this is not that kind of film. Don't Forget to admire Academy Award winner Colleen Atwood's (Chicago, Memoirs of a Geisha) colorful costume designs in the dreamy "By the Sea" sequence. The costumes are some of the only bright colors in the entire film, other than the blood. Worth Seeing Again? : The film is even more entertaining (and funnier) the second time around. I was browsing your site and I must say that you have some very well written reviews. I was wondering if you were interested in writing for a startup writing staff. I have contacted a number of reviewers with similar skills and interests with hopes to form a small gathering of casual writers. Send me an email at RTindall [at] gmail [dot] com if this interests you.